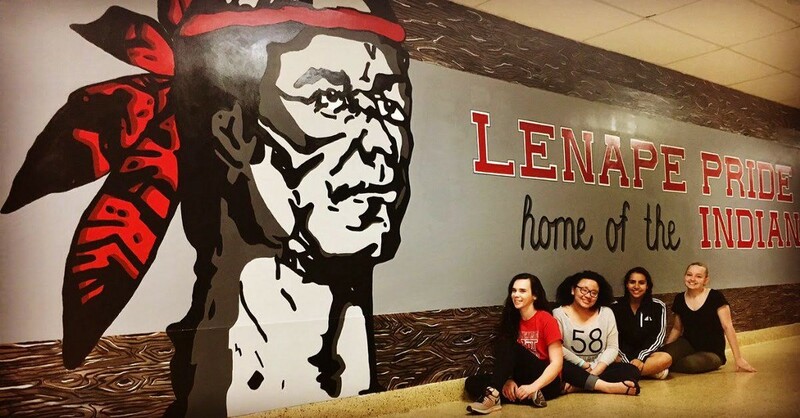 Lenape officials say after months of hard work, the huge mural was recently completed. Special to the Sun: Some Lenape Pride Mural with artists pose with the new mural. From left are Kayla Stevens, Sade Jones, Yostina Said and Anna Hrabowyj. Lenape High School’s Mural Club’s first mural is in the books — or actually on the wall. “Through meticulous attention to detail, Mural Club was able to create a hand painted master piece that will be enjoyed for years to come,” Ciavaglia said. Artists for the mural included: Art design director Ali Ciavaglia, lead design manager Anna Hrabowyj, and design assistants Sade Jones, Shanzeh Nasir, Laine Klimek, Kayla Stevens, Erin Sanderson, Yostina Said, Amanda Cicali and Rachel Anderson.